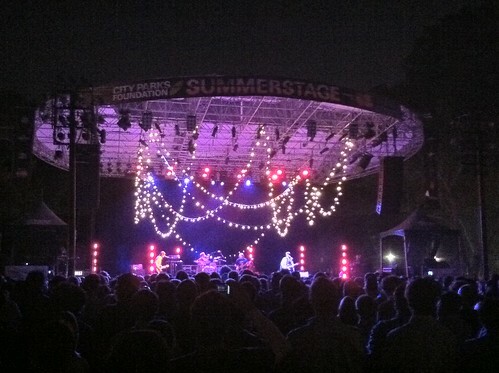 Pavement put the tickets for the Central Park Summerstage shows in Manhattan on sale about a year ago. The resulting advanced planning (or lack of skill at planning/holding onto tickets) of indie fans was even the subject of a recent New Yorker piece. The good news about doing things this way was that (a) Pavement sold the shows out and (b) cheap tickets were available for fans day-of. Those who weren’t daunted by the advanced planning were rewarded by what I believe to have been the best of the three Pavement shows I had (to this point) seen this year. The band was in a jokey mood, the weather was perfect (about the opposite of Wednesday’s experience), and the set was loose, jammy and ten minutes longer than the already very long Williamsburg Waterfront show. This show saw the band bust out several tunes not played at the Williamsburg show, including “In the Mouth of a Desert”, “Debris Slide,” “Shoot the Singer”, “Heaven Is A Truck” and the rarest inclusion (which was not on the official setlist), “Perfect Depth.” Expectations could not have been higher for a show that went on sale a year ago, but Pavement still gave us more than we could ever have hoped. This set was recorded with DPA 4021 mics mounted 12 feet in the air at the soundboard next to the JetBlue VIP area, unlike the mobile rig that I “stack taped” with on Sunday. The sound is therefore more stereo balanced, but reflects that the recording was made at a much greater distance from the source. There are also a couple of short spots of wind noise. Wednesday’s show was also recorded using the mobile rig upfront and, miraculously (given the rain), sounds excellent. We expect to post that recording, along with recordings of Thursday and Friday’s shows, to the site later this week or early next week. 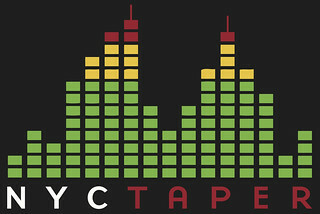 If you download this recording from NYCTaper, we expect that you will continue to support Pavement, visit their official website, go to their shows, and purchase the records and merch you don’t already own from the band’s official store or Matador Records.